I am usually a little skeptical about books or TV series there is a lot of hype around. For instance, I have not read the Harry Potter novel series yet nor have I come to watch Game of Thrones. As someone who follows The New York Times Best Seller list on a regular basis, it would have been impossible not to notice the constant presence at the top of the Young Adult Hardcover category of The Hate U Give. Additionally, I have read a myriad of highly positive reviews of Angie Thomas’ debut accompanied by 5-star ratings. Having just finished yet another psychological thriller, which is my typical genre of choice, and being undecided about my next read, I settled upon The Hate U Give. Needless to say, it was the right choice and I can assure you that this book has deservedly received its literary awards as well as the overwhelming praise from critics and readers alike. The Hate U Give is a raw, emotional and unforgettable tale about racial injustice, family, interracial friendship and relationship and the black community with all its facets. This novel raises awareness of the highly debated and controversial police brutality problem as well as presents the day-to-day interracial imbalances occurring in the life of a teenage girl of color attending a high school where everyone is white. All these subjects the author intertwined finely and objectively to one another, in my opinion, have made me dwell a lot on the differences between European countries and the US. I was born in Romania, a country where you seldom see a black person and where unfortunately, the school environment does not educate us about race, ethnicity, and interpersonal relationship. As a result, it should come as no surprise if a Romanian or other East Europeans behave awkwardly or unintentionally say something inappropriate and of racist nature when they are in the presence of a black person. On the other hand, I have been living for a year now in Belgium, which has a very diverse population and is in general open-minded. After reading The Hate U Give, I came to the conclusion that perhaps the racism and the subsequent problems that come along with it are less intense or rather less evident in some European countries than in the US. I for one feel fortunate to have the opportunity to experience and learn from eye-opening novels such as The Hate U Give. I sometimes read comments of certain people on the internet or even listen to my friends disapproving of the increasing use of themes like politics, racial, ethnic and gender discrimination, sexual orientation in the content of books, TV series, movies and the like and it pisses me off. Of course I am aware they do not always provide a good or realistic representation of the issues the world is faced with but I find them to be somewhat reflective of specific real life situations nonetheless. The Hate U Give is one of a kind because it is a complete and coherent piece of writing. It is well-written with a first-person narrative properly tailored to be representative of the protagonist’s age. The line-up of characters is another aspect that contributes to the value and significance of this novel besides its selection of important, sensitive themes. Each and every character who is part of Starr’s life and Starr herself are nuanced, complex and well individualized. I loved the genuineness of the dialogues and relationships established between the characters. Love, empathy, devotion and all sorts of other feelings the characters showed towards one another made The Hate U Give an emotional roller coaster. This novel makes you enraged, disappointed, disgusted by the racial inequity and the ugly things that happen in the world but at the same time it also gives hope and encourages you to speak your mind. I laughed at momma Carter’s witty remarks, Sekani’s innocence and funny comments, Starr’s father’s reaction when he found out about the relationship his daughter was having with Chris, a white guy from school or the description of white people’s habits Starr and Seven gave to Chris. I appreciated the gentle manner in which the author revealed the differences in mentality among the black community, especially the members of Starr’s family, for example, the fact that Starr’s mother wanted to move out of their poor and violent neighborhood, while her father did not agree with this sentiment at first, having the feeling he would turn his back on the people of Garden Heights by leaving. I am honestly at a loss of words when it comes to arguing why The Hate U Give is such an astounding read and it is challenging to capture all its worthy components in a few paragraphs. Although it has over 400 pages, it reads rapidly and you are likely to want to defer the end of the book. 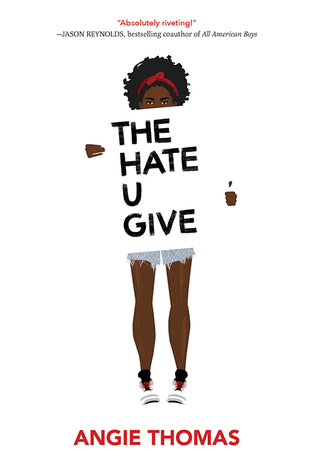 The Hate U Give is the best book I have read this year together with Little Fires Everywhere and I am impatiently awaiting the upcoming movie as well as the release of Angie Thomas’ second publication.